Almost half a century ago, in 1937, when Hobbs was a small oilfield town struggling to survive the depression of the thirties and the bust after the boom of a decade earlier, a group of community-minded people formed the Little Theatre Club. According to one of its charter members, Tom Mason, it was originally a social club, "along with the avowed intention of producing some plays." The earliest meetings were held in the homes of Mrs. Ann Kimbrough and her sister, Mrs. Mary McIntyre. Later, meetings were at the Hardin Hotel, east Main and south Houston, then the center of Hobbs and much of the town's social life. It was there that the group presented several skits and then a Variety show titled "Fiesta" in Walton Auditorium. Success led to plans for a full-scale production of a three-act play. Mrs. Adele Daniels was elected to choose the play and direct it. "Another Language", a Broadway hit of the day, was chosen and some of those in the cast were M. T. (Zeke) Jernigan, Elwood Turrentine, John Martin, Marge Clevenger, Ethel Yadon, Fred Rollins, Nancy Rogers, Ray Haynes, and Mildred Burke. It was presented at the Reel Theatre, a movie house then at 207 West Broadway. According to Mrs. Daniels, "It was a whooping success." The next production was "Nut Farm" presented in the City Hall, and then "The First Year", which was presented in Eunice because no facility was available in Hobbs. "It went over big at Eunice," Mrs. Daniels recalled. Other early productions included "The Night of January 16" and "The Drunkard", which became something of a tradition of the group. With the advent of World War II, many of the members went into the armed services and the club was disbanded. It was to remain inactive until 1952 when it was again formed with 18 members at the reorganization meeting. One of the original members, Tom Mason, was instrumental in getting the organization going again and became one of the first board members when the group incorporated December 23, 1953, changing its name to The Community Players Of Hobbs, Inc. Its expressed purpose was "to give interested amateurs opportunities for dramatic experience, to stimulate interest in drama, and to produce plays that are interesting, entertaining and worthy of community support." Theatre after a month's rehearsal and was called "a success" by local critics. The next year, through the co-operation of the Hobbs City Commission, the Players found a home. The theatre at the old Air Base was re-opened and remodeled. Most of the renovation work was done by the members themselves. "Papa Is All" opened the theatre and the Easter holiday production of "The Betrayal" closed the season. The Air Base Theatre was used for productions until February 1959 when "Night Must Fall" was presented in the newly constructed Hobbs High Auditorium (now Nelson Tydings). In the program for "Suds In Your Eye", presented May 1956. Layne Hungerford wrote that the annual banquet and election of officers would be held in the dining room of the Harding Hotel. "Also something new this year, awards will be presented to the best male and female leads for the year, the best male and female supports, and the best bit player, the best directed play of the year. This banquet and presenting of awards is an innovation with us …" "The Hamster Awards", as they came to be called, are still the highlight of the annual banquet. In 1957 another first established by the Players was a Summer Theatre for teen-agers. Coordinated by the theatre group and arranged through the school system, rehearsals and productions were held in the High School Little Theatre. It was really the teen-agers' program with adults serving only as directors and offering assistance where needed. Three plays were presented that first summer and in the following year. The organization continued to grow throughout the 1950's. A controversial play of the day was presented in February 1957, "The Moon Is Blue", directed by Bert Wayt. In February of 1958 Charlene Olds directed "Gaslight". In November 1959 a huge audience-pleasing production of "Oklahoma" was directed by Norman Hatch, assisted by the Hobbs Civic Orchestra headed by David Hooten. The next year "South Pacific", directed by Norman Hatch, played to sell-out crowds at the Hobbs High Auditorium on November 21 and 22, 1960. A spokesman said in a newspaper article that approximately 250 people participated in the production with 52 in the cast and more than 5,190 man-hours were invested in the presentation. Beginning in 1959, there was a marked increase in community participation in the Players and its productions. Outstanding response increased the quality and number of productions - musicals, comedies, and dramas. An Honorary Advisory Board of Directors was established which was a "Who's Who" of Hobbs’ business, professional and community leaders, too numerous to list here. The widespread community support led the Players to start planning seriously for a long-time goal of having their own theatre. In July 1962, James M. Murray III, an architect, released design drawings for a theatre to be built at 1700 North Grimes. The building fund drive started officially in June 1963. That same month a Managing Director, Gertrude Dimple, was appointed. By July 3rd, co-chairmen Hungerford and J. S. Murdock announced that the halfway point had been reached for the "pay-as-we-go" building fund. The seating capacity was approximately 250 and opening night February 11, 1964 was a sell-out gala performance of "The Third Best Sport", a comedy directed by Layne Hungerford. That first production was presented in-the-round, for which the theatre had been designed. To demonstrate the versatility of the theatre, the next production, "The Mousetrap", was presented on a projected or thrust stage and the third play, "On Borrowed Time", had a traditional proscenium stage built especially for the production. During that 1963-64 season the Managing Director, whose tenure lasted for only one year, organized for fund raising a Woman's Committee, Adult Plays for Children (sponsored by the Association of American University Women), The Minstrelettes, a rummage sale and several style shows. In 1965 the Playhouse was the center for many activities. For example, in March there was a party given for members and friends, a duo-piano recital, and a USO Choral performance directed by Norman (Buck) Hatch. In August of 1965 the Playhouse hosted the Midland Community Theatre's production of "The American Dream", which was the U. S. entry for the International Amateur Theatre Festival in Monaco that year. March 1966 marked the first musical production in the new theatre, "The Boy Friend", directed by Glynese Floyd, and it was very successful. At the annual awards banquet held June 1968, the first Tom Mason Award was presented to Larry Johnson for outstanding contributions to the Community Players. Johnson retired that year after serving 15 years as a director and treasurer on the Board. The award, still given, is a memorial to Tom Mason, who himself served the Players in many capacities including actor, director, president, Board member, and advisor. Unfortunately, as of this writing, basic source materials for the years 1969-79 are not available. However, a general consensus of opinion expressed by some of those active during this period is that for various reasons participation of individuals and the community, which swelled in the years from 1952, began to decline in the Seventies. In fact, attendance and funds reached such a low during 1973-76, some members of the Board seriously entertained selling the Playhouse. However, in 1976 a special fund raising campaign netted enough from community contributions to pay-off the building mortgage. This effort was successful mostly due to the daily coverage and promotion donated by the Hobbs News-Sun. Also, a contribution of $4,500 from the Levi Straus Foundation made building improvements and renovation possible. Some well remembered productions considered to be outstanding from this period were: "Dracula" (1971), directed by Pepper Murray; "Mame" (1973) and "An Evening With Shakespeare" (1974), directed by Glynese Floyd; "The Glass Menagerie" (1975), directed by Art Haggerton; and "Arsenic and Old Lace" (1979), directed by Pepper Murray. By the 1979-80 season attendance was very low and approximately 45 season memberships were sold. In the summer of 1980, the Board hired a newcomer, Edd Wells, as Managing Director. He immediately organized promotion and publicity to improve the Playhouse image and increase the membership. For the 1981 season, memberships and attendance increased more than 100 percent. An expansion of the schedule doubled the number of productions and the community was again awakened to the potential for an outstanding community theatre. For the first time in many years the organization was able to balance its books. For almost 20 years the Playhouse stood on leased land. In 1981-82 a special effort and fundraising made possible landscaping and purchase of the Playhouse grounds. Over $35,000 was contributed due mostly to the efforts of Mrs. Doris Williams. Close on the heels of that success came another. Early in 1983 the Community Players was awarded the distinction of being the best in the state of New Mexico when its entry in the Festival of American Community Theatres state competition won first place. The entry, "Lemonade", was directed by Ed Wells and starred two outstanding actresses, Rita Oliver and Kathy Wacker. They went on to win Best Actresses in the regional competition. With the growth and support evident in the Hobbs community, the Board of Directors voted in 1983 to mount yet another fund drive in order to restore the Playhouse and make badly needed improvements to the building and equipment. Considering the long and successful history of the organization, the community interest in live theatre and all the hard work donated by thousands of people to accomplish that goal expressed 30 years ago "to produce plays that are interesting, entertaining, and worthy of community support", a great deal of pride and success in Hobbs can be afforded the Community Players. Summer is fast approaching which also means it is almost time for the 2009 Performing Arts Camp open to students ages 9-18. This year's production, Annie, Jr. will be presented as the culmination of the 5 week camp. Roles will be assigned after auditions - every child will have a role. Space is limited to the first 35 paid applicants. Students will receive instruction in all areas of play production including basic theater terminology, stage movement, character development, voice production, singing, dancing, and much more. Student participation in activities will be appropriate to their age and skill level. The staff for the camp consists of professional educators and theater practitioners, as well as many volunteers from the Community Players of Hobbs, who are dedicated to providing quality instruction and a positive learning environment for every child. Technical Director - Kenneth Brown. For an Arts Camp Schedule and/or an application for Admission to 2009 Performing Arts Camp please contact the Community Players of Hobbs (575-393-0676) or the Lea County Commission for the Arts (575-397-ARTS). You can also click here for a PDF copy of the application. The first two shows at the Hobbs Community Playhouse were a huge success. Here's a recap if you missed out on all the fun. Pump Boys and Dinettes is a musical set in the south at a gas station with a diner next door and has been described as being "As refreshing as a cold beer after a bowl of 5 alarm chili." Directed by Glynese Floyd, the cast consisted of Tim Cummings, Brian Henning, Paul Hobbs, Kaine Munoz, Ronnie Gray, Mark Sanchez, Evan Witkowski, Sandy Goad, Helen Van Kleeck, and Erin Anderson. A live band, witty banter, and toe-tapping songs kept the audience entertained throughout the entire show...it also helped that during intermission pie and coffee were served in keeping with the "diner" theme. The entire cast and crew did a fantastic job making each night special for the audience. A Company of Wayward Saints follows a dysfunctional troupe of actors as they attempt to earn enough money to go home. Samantha Collins directed this commedia dell' arte style group consisting of Matt Blandin, Larry Harlin, Robert Schumacher, Brad Jett, Bill Raabe, Nick Keele, Briana Schneider, Erin Anderson, and Ash Baer. Throughout the play, the Company experienced feelings of arrogance and selfishness which eventually became feelings of acceptance and teamwork. The audience was treated to everything from slapstick comedy to deep philosophical moments contemplating the human condition. Once again, cast and crew presented an entertaining evening for audiences. A wonderful show. Congratulations to the cast and crew of both shows! Be sure to make plans to attend the upcoming show: Rabbit Hole directed by Nathan Miles. Steel Magnolias, by Robert Harling, is a 1987 off-Broadway play, made into a movie in 1989. Based on the author's experience with the death of his sister, Steel Magnolias is a comedy-drama about the bond among a group of Southern women in northwest Louisiana. "Steel Magnolias" will be directed by Suzanne Wilson-Wuest, with Assistant Director Mary Lyle. A classic that was a hit movie and continues to be an audience favorite on stage. The comedy-drama explores a group of Southern women bonding in southwest Louisiana in Truvy's beauty parlor. Family, friendship and loss are handled with humor and insightful conversation about life and obstacles that must be overcome. October 2nd, 3rd (8 PM), 4th (2 PM), 9th, and 10th (8 PM). Becca and Howie try to cope with the death of their only child, a four-year-old, in an auto accident, while Becca’s well-meaning mom and off-kilter sister attempt to lift their spirits (and deal with their own problems), each in her own inimitable way. The couple's lives are further complicated when the young driver who killed their son contacts them seeking closure as well. "Rabbit Hole", winner of the 2007 Pulitzer Prize for Drama, will be directed by Nathan Miles, a recent graduate of West Texas A&M. Shows are June 19th, 20th, 26th, and 27th at 8 PM. 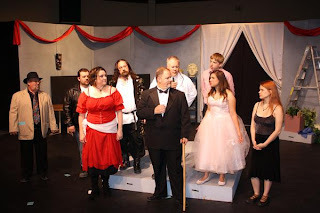 This is the new website of the Community Players of Hobbs, a community theater in Hobbs, New Mexico. Please pardon the dust, set work is in progress.